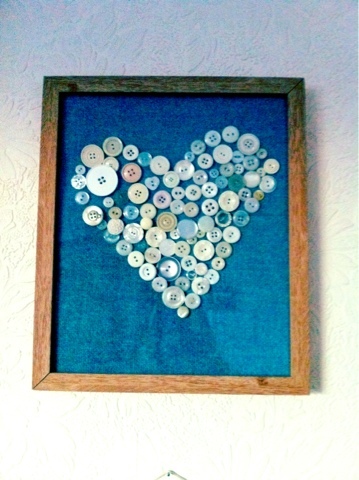 I have been inspired by a few button pictures that I have seen recently in shops so I have made a button heart picture for our bedroom. It took only about an hour to make (and that was whilst I was also watching sunday eve tv) so a perfect quick evening craft project. It was also a great way of using my stash of favourite buttons that I keep (well hoard is probably more accurate!) for 'special' projects as it seems a good way of displaying them. 4) pop the picture into a frame and there you have it a lovely new picture for your wall! Nice and looking very beautiful like the framing album. Thanks for those tips and items needed listing.